In a medium pot, heat the olive oil, add in diced onion, sugar, red pepper flakes, dried oregano, salt and cook over medium heat for about 10 mins. If the onions are browning, turn down heat. You want the onions to be soft but not brown. Add in garlic, anchovies and cook for another 2 mins. To the onion garlic mixture, add in tomato paste, diced tomatoes, tomato puree and pecorino romano cheese. Stir well and simmer over low heat for about 20 mins. In a large bowl, add in cottage cheese, grated pecorino romano cheese, whipping cream, minced garlic, salt, pepper, cornstarch and mix well. The cornstarch will prevent the filling from curdling during baking. 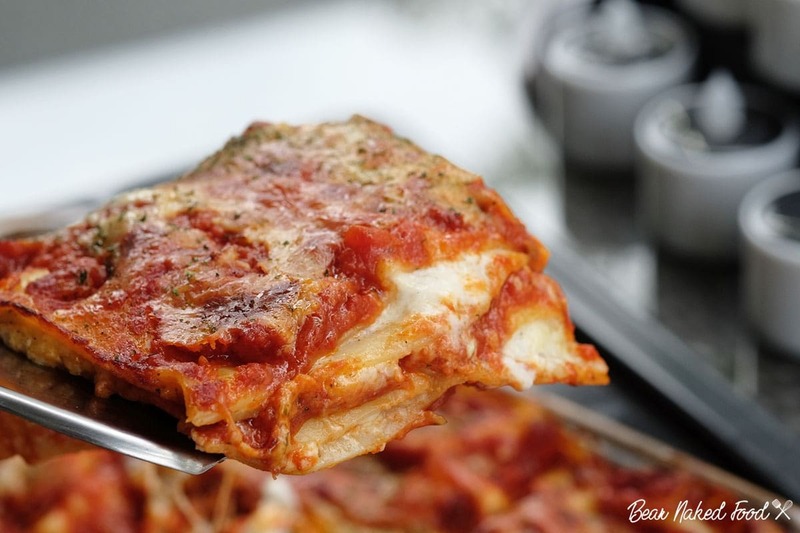 Place dry lasagna noodles in a large deep tray and add in boiling water, covering them all the way and soak for 15 mins. This will soften the noodles. Use a sharp knife to separate the sheets to make sure they are not sticking together. Carefully rinse each sheet and dry them on paper towel. Wipe and pat dry the noodles. Using a 11 x 7 inch rectangle pan, add in 1 ½ cup tomato sauce and spread it out. Arrange 3 sheets of noodles to cover the sauce. There should be a shorter piece on one side of the tray. Add half of the cottage cheese on top of the noodles and spread out evenly. Sprinkle ½ cup shredded mozzarella evenly all over the cheese mixture. Arrange another layer of noodles on top, with the shorter piece in the opposite side from the first layer. Repeat with tomato sauce, shredded mozzarella cheese and add on another layer of noodles. Add on the rest of the cottage cheese mixture, another ½ cup of mozzarella cheese and add on the final layer of noodles. Put the remaining sauce on top, mozzarella cheese and pecorino romano cheese. Lightly oil a piece of aluminum foil and cover (grease side down) the tray. Bake in preheat oven for about 30 mins. Increase heat to 500°F/250°C, remove foil and bake it for another 8 – 10 mins, until the top is nicely browned and bubbling. Remove from oven and allow to cool for 20 mins before cutting. This will allow the lasagna to rest and firm up. Sprinkle some chopped basil and serve.